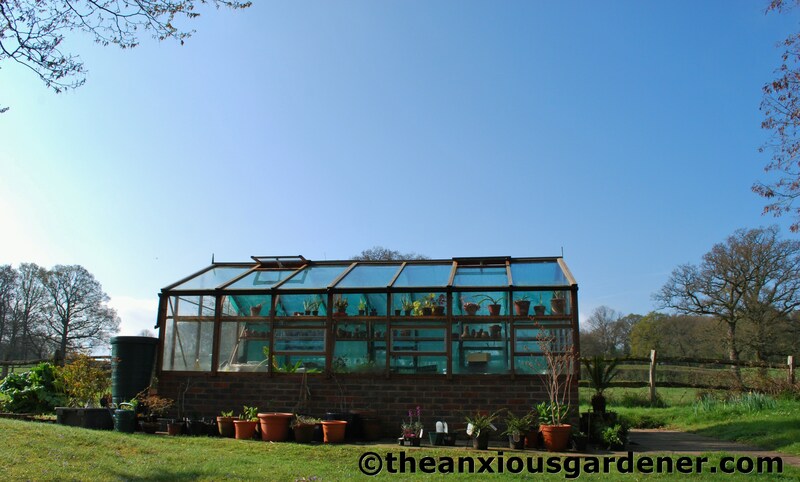 Early April was so hot and so sunny that I screened the south-side of the greenhouse with netting. 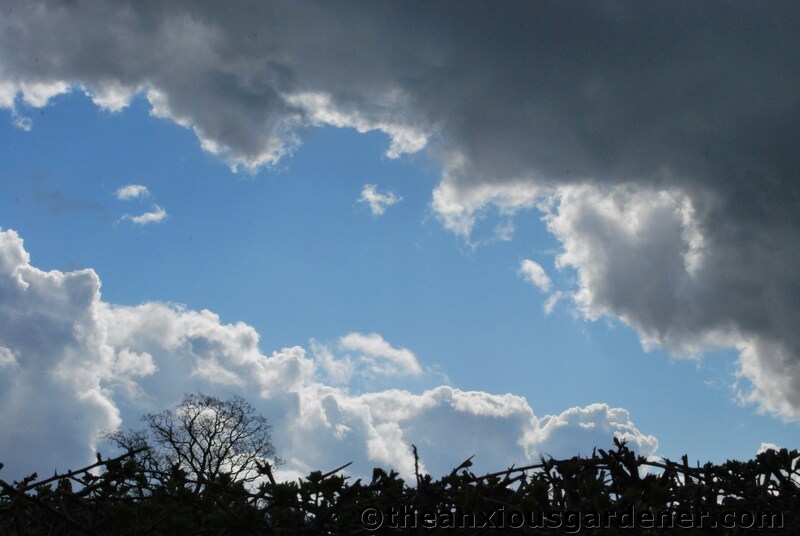 … dark cloud, temperatures dived and we had weeks of rain. And rain. And then … some rain. But if the sun does ever peek out again, I shall be prepared. 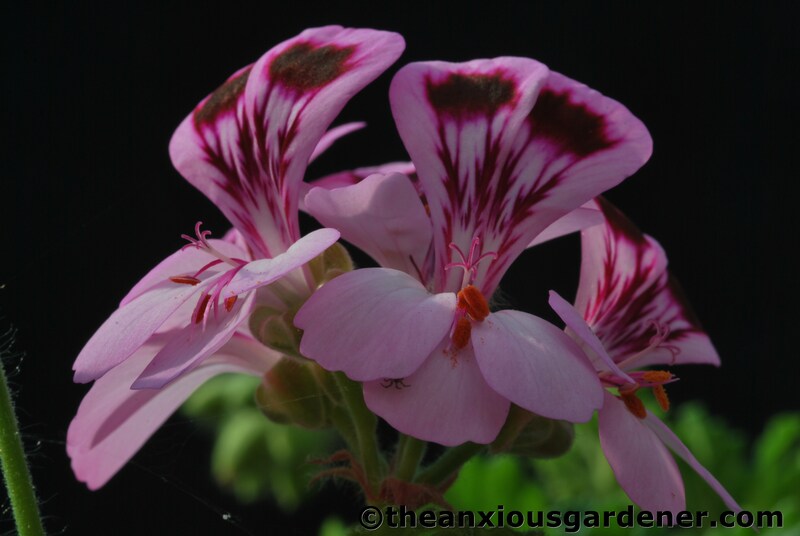 It had grown too stifling in the greenhouse for me to sit and drink tea. And that will never do. In previous years, I have lost plants to late frosts (to which the Priory is prone) and so I am probably overly cautious in moving tender stuff outside. 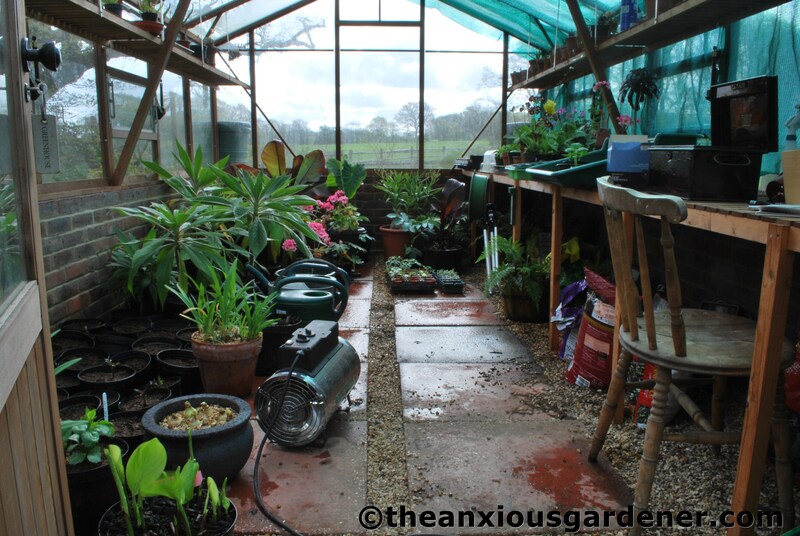 The greenhouse is heated by a fan heater (the size of a small jet engine) and the cosseted plants within are blissfully unaware of the wet, cold horror outside. … the weirdly beautiful, powder (or bloom) coated sugar-almond plant … or moonstones … or, as Jim calls it, the hemorrhoid plant. How uncouth. 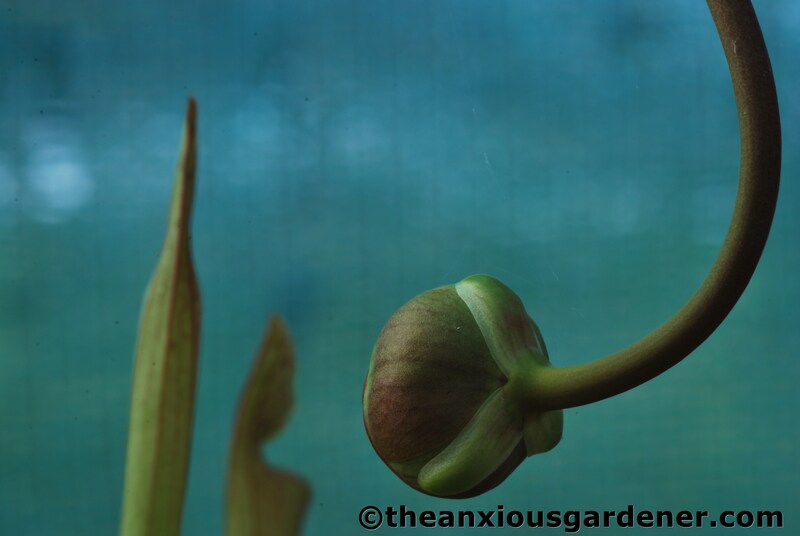 … though this one’s new growth is itself splitting, to reveal yet another new set of leaves. Curious. 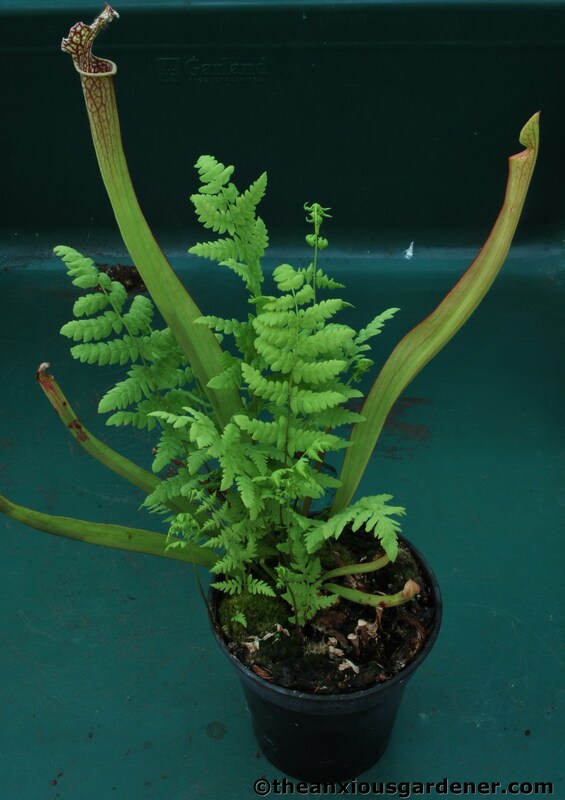 An interloper has found a home in one of the pots of sarracenia but I haven’t the heart to remove it; I love ferns. … are a deep claret. I have no idea why. 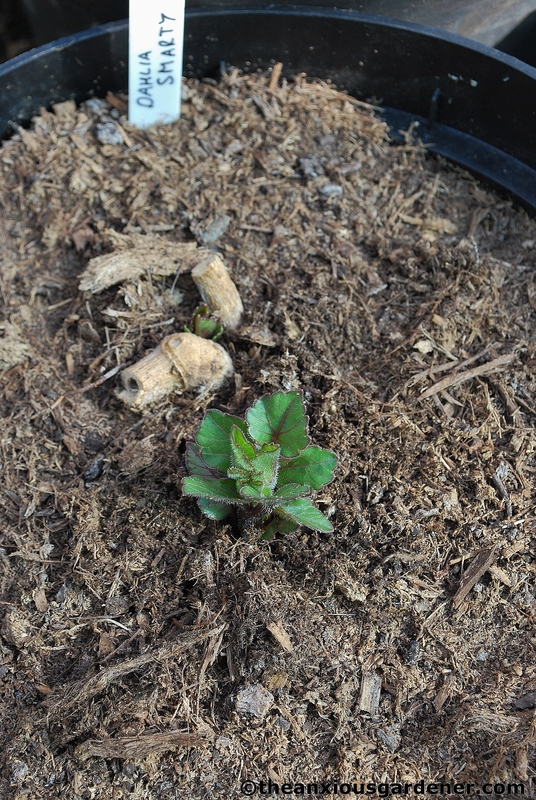 Most of the dahlias I potted recently are poking forth. 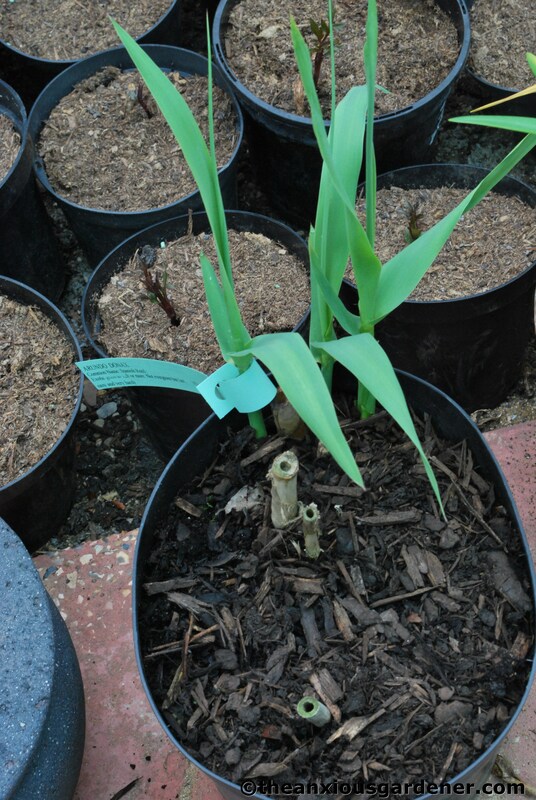 I find starting them off in pots gives them an advantage over the slugs – for when they are eventually planted outside. After a recent visit to Architectural Plants (on yet another rainy day), there are new tenants in the greenhouse. For the tropical border, I’ve bought a plant I’ve long hankered after – Tetrapanax papyrifer ‘Rex.’ This architectural, hardy exotic should reach 3-4 metres in height with leaves a metre across. Goodness. … this not-at-all-hardy canna lily, Canna coccinea; relatively petite at about one and a half metres tall (though I’ve heard that it might struggle to get that high). The east pond. Normally the alders stand well clear of the water. The flood waters haven't washed out as much duckweed as I would have liked. 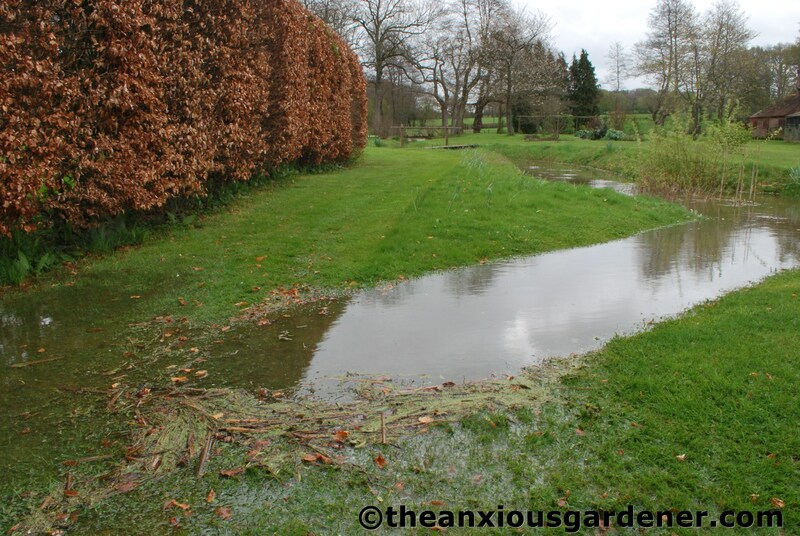 … is carrying excess water out to the river – and away from the front door of the house. Phew. Thank goodness the South of England is officially in a state of drought. Otherwise who knows how wet it might be. Whatever the weather, Dave, you seem incapable of writing a boring post. 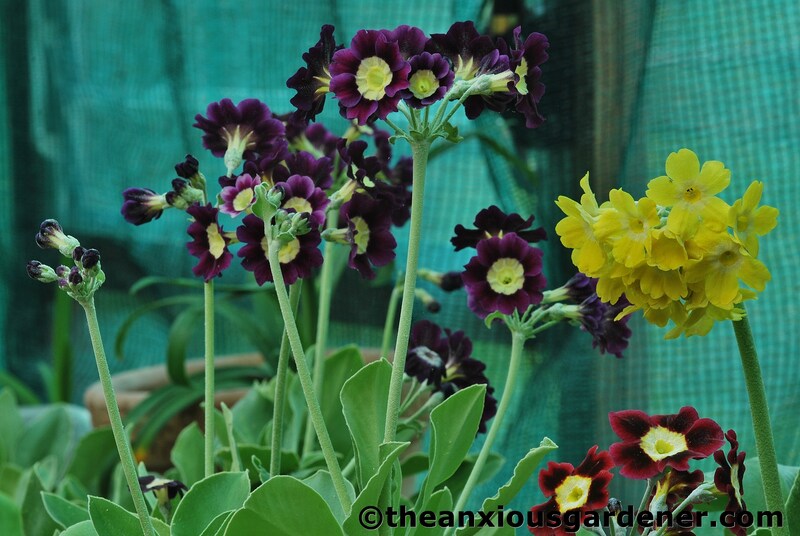 I love your Auriculas! 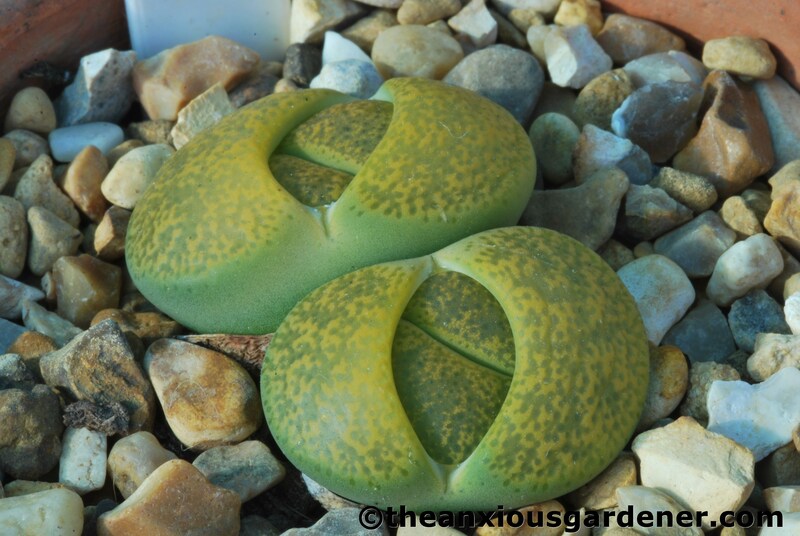 The Lithops look fascinating close to – quite otherworldly. I have some Sarracenias and the ones that have dark red flowers like yours are leucophylla hybrids. 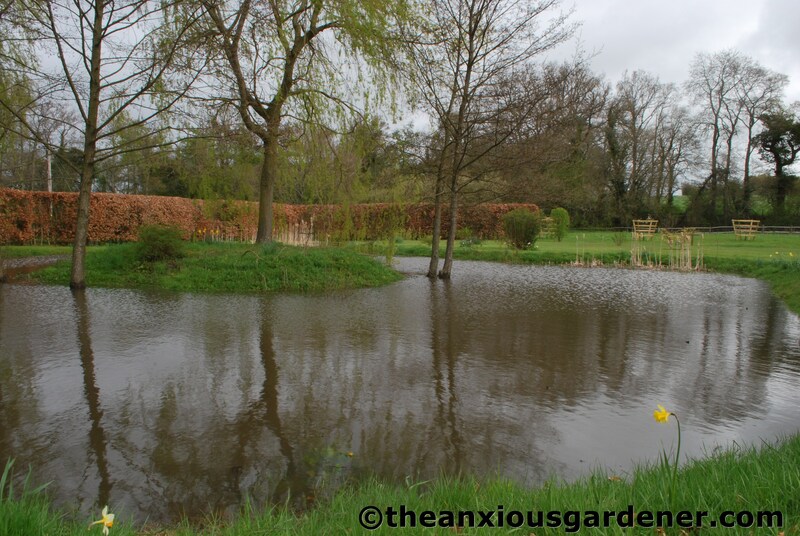 Lovely to see your pictures taken in this time of drought – surprised not to see your garden colonised by ducks ! 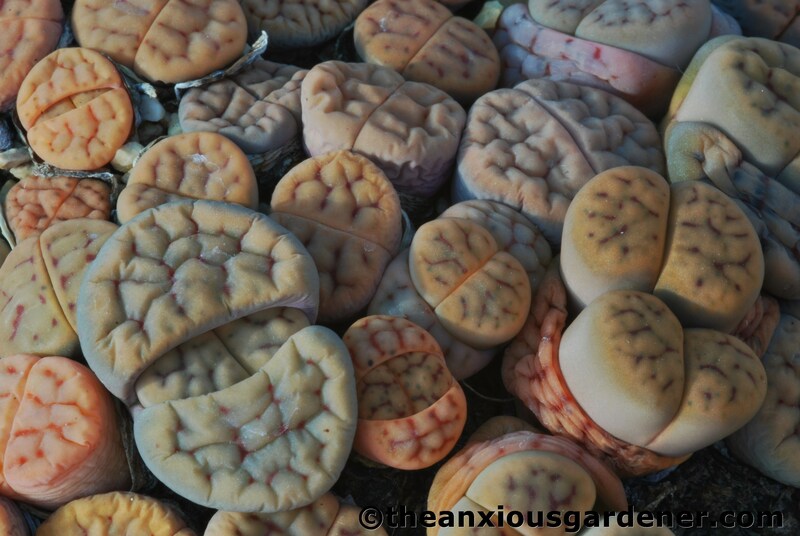 Love your weird and wonderful stone plants…especially the one hat supposedly has a resemblance to piles. Thankfully I don’t know if it has that likeness. I love all your plants, I’ve never seen many of them before! I’m a strictly vegetable gardener (sunflowers excepted). I should also mention I’m super jealous of your greenhouse. Cheers! You have such interesting plants in your greenhouse! 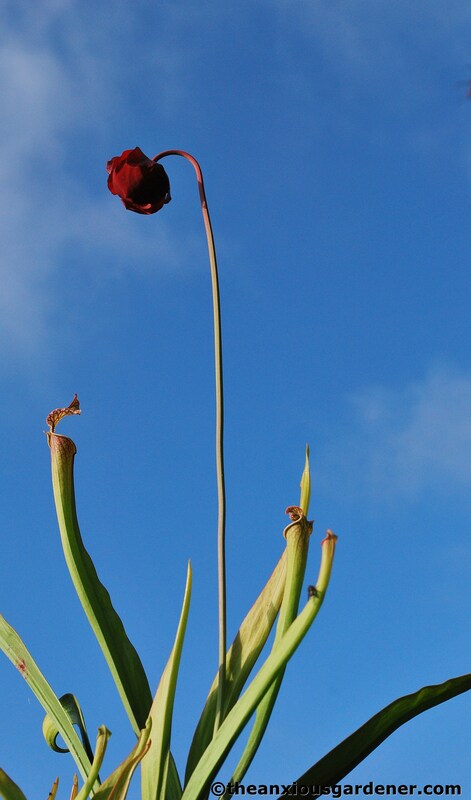 Do you put the Sarracenia’s out at any point or are they inside all year round? Are they hard to keep going? I’d love to give one a try! Nah, easy peasy, lemon squeezy. Just don’t let them dry out is all (though not overly wet during the winter). They are hardy too and I’ve always intended to plant some outside. Here’s a pretty photo of what they’ve eaten! Sending you a truck of 2 by 4 lengths of wood, a bags o’ nails & a hammer to build yourself an Ark…looks like you need it. 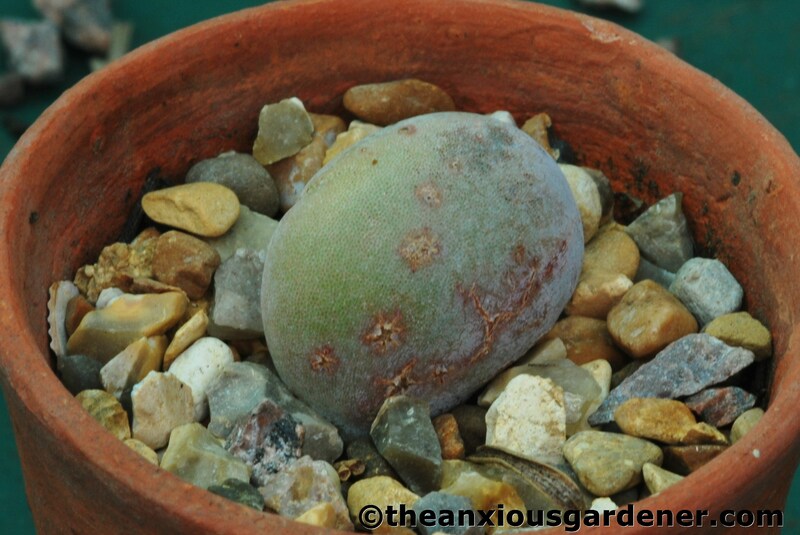 Never heard of the Lithops or Moonstones before…quite fascinating! Same here Dave! As soon as they declared the North East of Italy officially in a state of drought it started raining! And it rained and rained… I haven’t seen raining like that for a year! Now it stopped and a hot bubble of hot African air is over us, drying everything like in a oven. The wet ground is forming a crust like terracotta! 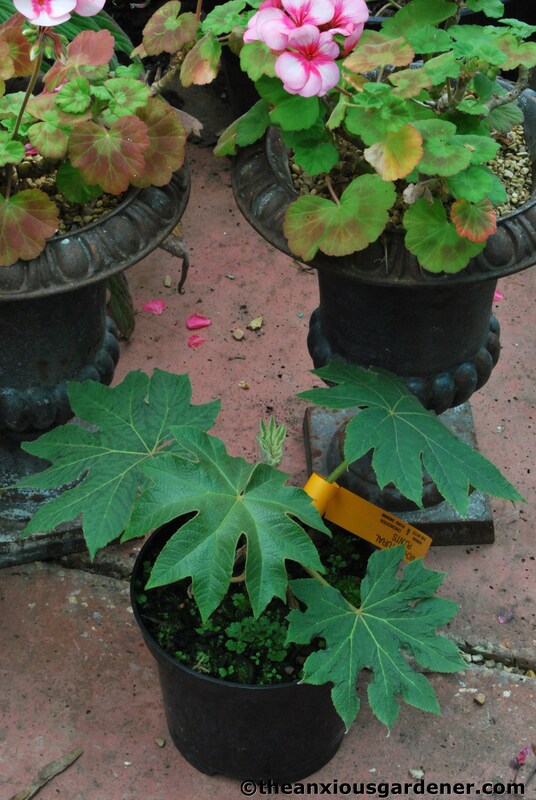 Tetrapanax papyrifer looks stunning, I think it shall be a relative of ivy, right? I read Mr K comment before leaving mine and I just wanted to add some more first hand drama to what he wrote! 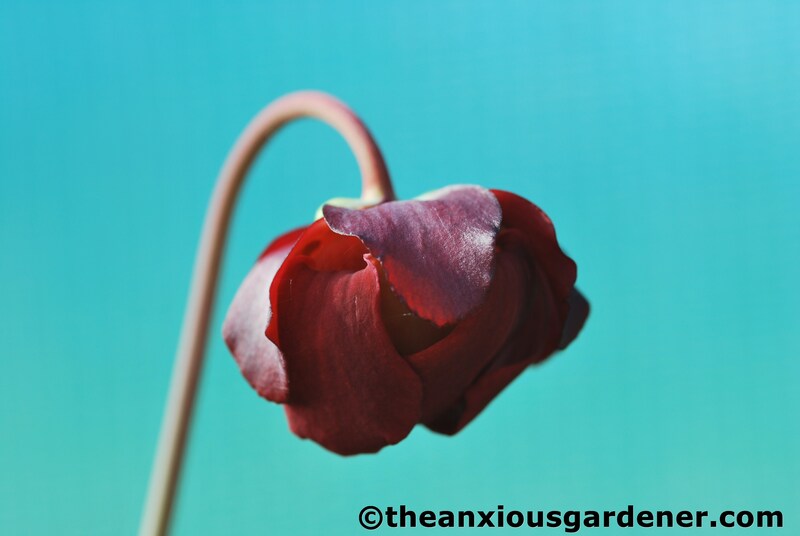 Keeping it in a container could be a very good idea, keep the pot over the ground level so the plant doesn’t walk around! 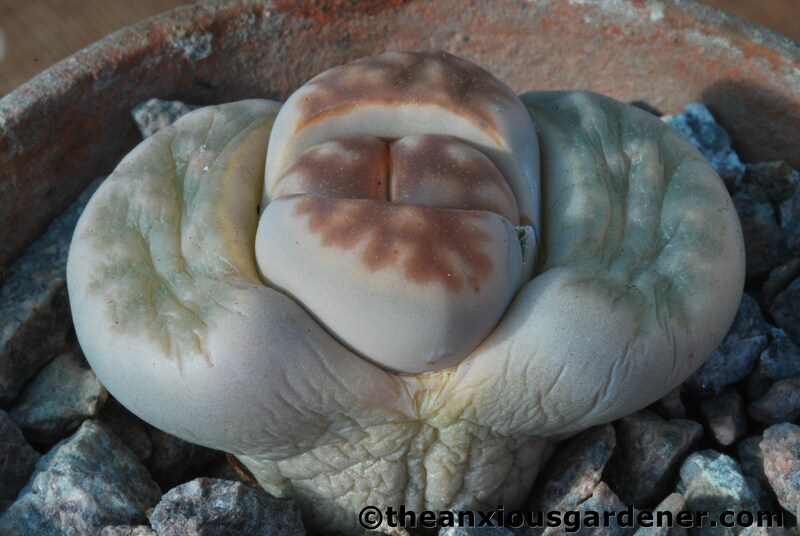 And here I thought the lithops were fascinating when they bloomed. Wow, Dave–those new leaves are AMAZING! There’s something very modern art about the green ones. This is a naive question from someone in a dry climate, but how do you keep the greenhouse from getting too humid when it’s rainy for days on end? How do you avert problems like damping off and all those kinds of things? Is your prickly pear happy? I’m sorry to be a drought snob, but I don’t think you all are really doing the thing properly over there. 3 cheers for the drainage channel! Loving your unusual greenhouse plants. I’ve always been fascinated by those stone plants. I’ve never grown any but I never fail to be amazed by the different forms plants take. My dahlias, safe in a cold frame are pushing through but like you I can’t do much else. The ground is too wet to plant and I’m suffering from coldframe and window sill backlog. If I can’t get some plants out soon I’m not sure what I’m going to do. 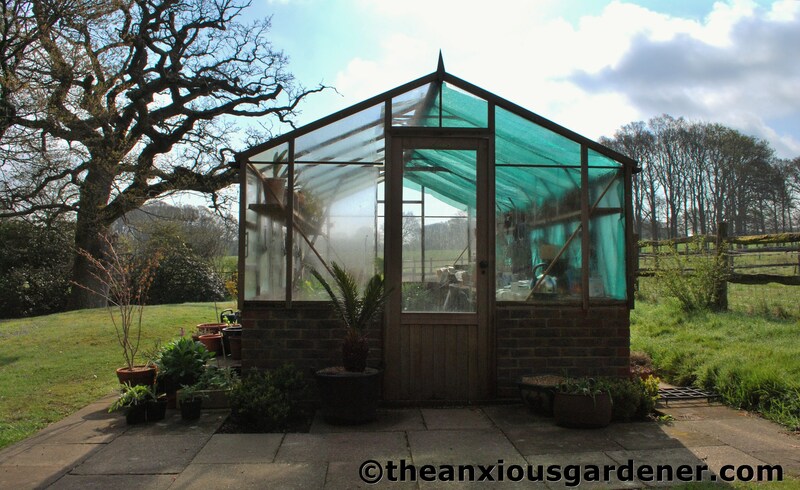 I’m very envious of your greenhouse. I could quite easily while away days in there, sheltered from the weather with a cup of tea. 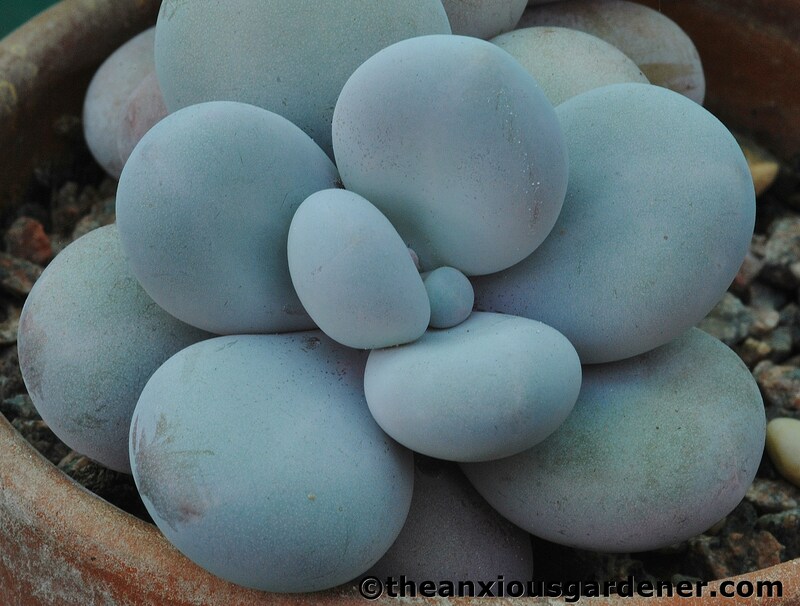 I did a post of about lithops last year, WW – they have the most beautiful flowers; I’ve loved them since I was a kid. 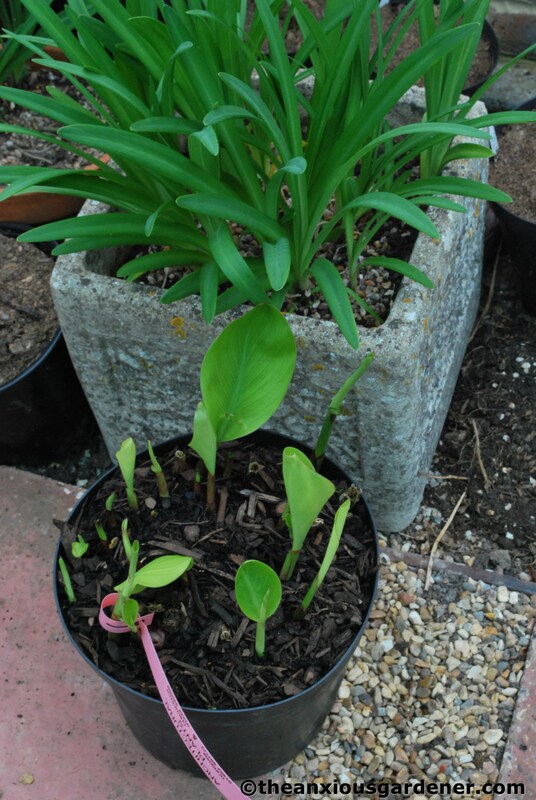 Finally managed to plant out some lilies and the tetrapanax yesterday on a rare sunny afternoon. Joy. 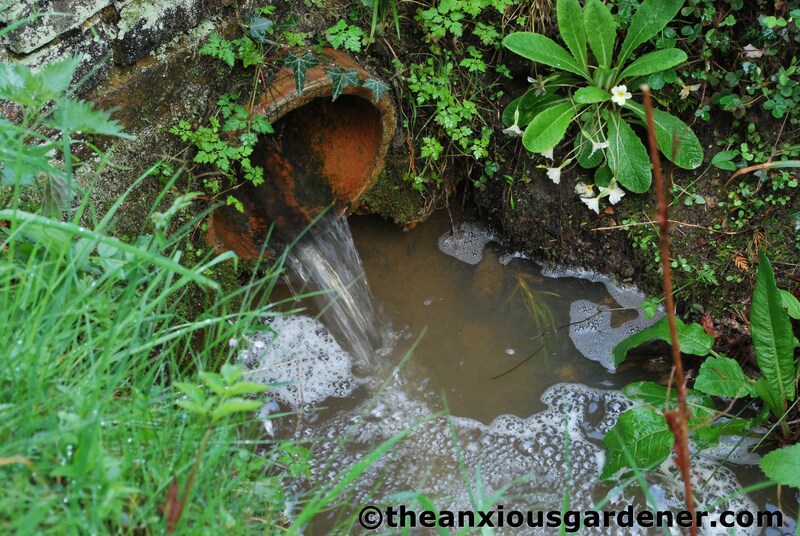 So take care….I fear for your drainage channel, if that gets into it! Such irony isn’t it! They announce the hosepipe ban, all of us bask in the early spring warmth and the heaven poured, and poured, and poured…. Great photos as always! You’ll love that T-Rex, plant it out, stand back and watch! Getting the greenhouse done is still well worth it. Once the sun decides to come back (hopefully soon) at least you’re prepared and don’t have to do it. One tick off the box! oh I dont like those living stone things at all – remind me of brains! I gave up shading my greenhouse about 3 years ago as whenever I put shading on the weather deteriorates. My dahlias are showing no signs of joining us either hopefully they will get their act together soon or it will be another non-dahlia year like last year. Looks like it is scientifically proven that greenhouse shading induces wet, cold weather. I shall write a paper. What weird and wonderful plants you grow in your greenhouse. All the fields round here are like lakes – luckily we live on top of a hill – all the streams are like rushing torrents – and my wellies have sprung a leak! Your wellies have sprung a leak? My waders have! As I discovered when planting new water lilies. A constant cold trickle – imagine!